Contraceptive pills are the combination of two female hormones called oestrogen and progestogen. Their action is to stop women from ovulating and there by not getting pregnant. 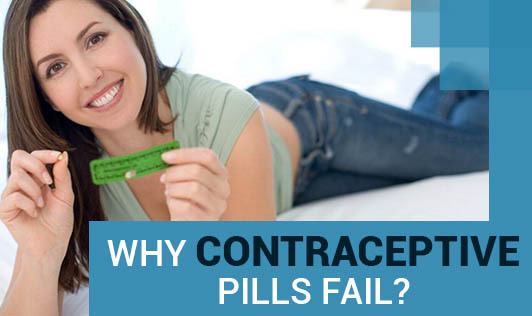 But, many a times, contraceptive pills fail in their action and conception happens. The failure happens due to many reasons. 1.If you have diarrhea and/or vomiting. 2.Oral contraceptives may not be that effective if consumed with anti-epilepsy drugs and some herbs. 3.When you fail to follow the instructions of the doctor. 4.When you forget to pop a pill. 5.There is nothing like safe or unsafe period. Many researchers say pregnancy can happen at any time. So missing a pill thinking you are in the safe period may not actually be safe for you. 6.Do not miss to read the instruction written on the tablet cover. 7.A Woman's body might fail to respond to contraceptives due to hormonal imbalances. 8.If you are a chronic smoker or an alcoholic. 9.If you have any disorders such as hypertension, hypercholestremia and diabetes. 10.If you stand at a grade of obese II or obese III. Do not try to avoid the complications faced by failure of contraceptives. Call or meet your doctor immediately.